song of this year’s FIFA World Cup, Goan song ‘Dispara La Meta’ comes as a breath of fresh air. The song, with an upbeat tempo and salsa vibes coupled with visual treat of playing football, is receiving a fabulous response. The video received almost 10,000 views in just four days of being uploaded on YouTube. ‘Dispara La Meta’, produced by Six String Production in collaboration with The Runks, has become the Goan favourite anthem for the football season. Georgie Dias, a musician and band member of the Runks, conceptualised the song keeping in mind the love Goans have for football and music. “Being a musician and also a FIFA lover, I decided to convey a message to all football lovers, in my language, that is music. I rang up my colleagues and we gave this song a new life. We planned on starting it ten days before the tournament but the recording took us quiet sometime and then the bad weather delayed the shoot. The entire video took 25 days to complete. Spanish terms are more catchy and have got a rhythm to it. ‘Dispara la Meta’ means ‘shoot the goal’ and ‘Juega Duro’ translates to ‘play hard’, which is pretty much what I want to tell all the listeners. 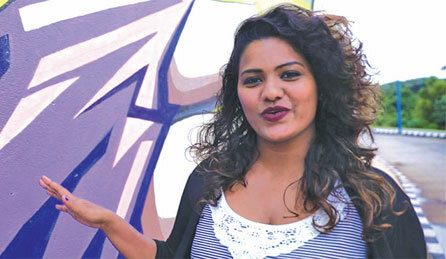 Jeslan Ferrao is the lyricist of the Konkani verses and I have written the rap and the English portion of the song,” says Georgie. The song features the voices of Ancy Gonsalves, Sheldon Gomes, Jeslan Ferrao and Georgie Dias, while the background singers are Edelbert Azaredo, Jeffy Rodrigues and Swilton Fernandes. “The crew was the heart of this video and without them,nothing would’ve been possible. We had cinematographer Josephfern D’Souza along with Pankaj Karapurkar. The dance crew consisted of Joyston, Grizel, Jeffy, Emma, Switzel, Denica, Ruth and Sanriel. We also had a lot of support from Karol, Franjoy, Agnelo, Edelbert, Kenneth, Jordan and Pascoal. Meavan Fernandes was our drone operator,” adds Georgie. Speaking about some of the challenges to produce a great song on such a short deadline, Georgie explains: “There were a lot of obstacles in the development of the video, the first being bad weather conditions in Goa. We had to call off the shoot almost six times before we could actually finish the shoot. The shoot took us almost 10 days to complete. Mastering and mixing of the song also was not an easy task. Royston Noel did an awesome job despite time constraints. We tried to find places that have the potential to grab attention but are often overlooked. Many shoot locations were unavailable. We finally shot the video in Panjim, Bambolim, Panchayat Football Stadium in Raia, Guirim fields and also the studio where we recorded the song. We’ve tried to keep it as raw as possible. The footballers aren’t professionally known but yes, we believe that they will rise and shine one day,” he says. What is the message they want to give out through this inspirational peppy number? “The message is quiet simple: ‘When you fall, get back up, you’ve got all those moves, pass korun ball, ghevun dhanv nettan, mar tum shoot’,” concludes Georgie.